The Philadelphia Eagles began the 2017 season with the National division pro football traveling championship, then kept it for half of their regular schedule. They were clearly the best team of the year. 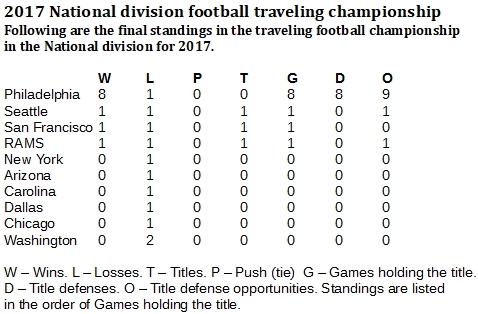 Unlike the Continental traveling football championship and it's American division, where the New England Patriots are beating everyone else by a mile in traveling championships, well ... the Patriots aren't in the NFC. Thus, we may account for an interesting and even race in the race for traveling glory among pro football's larger markets. 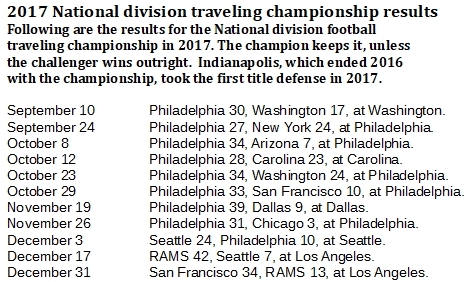 The Philadelphia Eagles were the news-making team of 2017 for the National division traveling championship, building on news they first made on Dec. 22, 2016, when they pulled a 24-19 home-field win against the New York Giants for their 10 National division traveling title since the competition began in 2000. The Eagles were a last-place team in 2016, so the traveler didn't go to the playoffs. Instead, it stayed offseason with the Eagles, who then began 2017 with eight straight victories, giving them 10 straight overall since first capturing the title the earlier December. It was the longest National division title streak since the Green Bay Packers set the record with 16 straight wins over a period of more than a year. The Packers won it with a 10-3 home win against the Chicago Bears on Jan. 2, 2010, and didn't lose it until the New York Giants beat them, 37-20, in New York on Jan. 15, 2011. The only other longer winning streak in National division history was an 11-game streak for the Bears, who took over with a 26-0 win against the Packers in Green Bay on Sept. 10, 2006, then held it until losing at home to the Packers, 26-7, on Dec. 31 of that year. With their eight 2017 wins, the Eagles not only were National division Team of the Year, but they improved to 26 overall wins since the competition began in 2000. They trail only the Packers, who have 29 wins. Following the Eagles are the Seattle Seahawks (23 wins), the Bears (19), the Giants and San Francisco 49ers (18 each), the Rams and Dallas Cowboys (17 each), the New Orleans Saints and Carolina Panthers (15 each) and the Minnesota Vikings (14). The Giants have won the most National division championships with 11, followed by the Eagles (10), 49ers (nine), the Cowboys, Seahawks and Packers (all with eight), the Vikings (seven), then the Bears, Saints and Rams (all with six).